This edited volume systematically addresses the connection between Wilfrid Sellars and the history of modern philosophy, exploring both the content and method of this relationship. 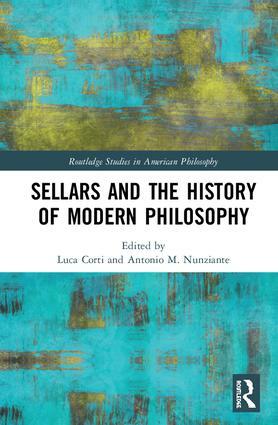 It intends both to analyze Sellars’ position in relation to singular thinkers of the modern tradition, and to inquire into Sellars’ understanding of philosophy as a field in reflective and constructive conversation with its past. The chapters in Part I cover Sellars’ interpretation and use of Descartes, Leibniz, Hume, Kant, and Hegel. Part II features essays on his relationship with Peirce, Frege, Carnap, Wittgenstein, American pragmatism, behaviorism, and American realism, particularly his father, Roy Wood. Sellars and the History of Modern Philosophy features original contributions by many of the most renowned Sellars scholars throughout the world. It offers an exhaustive survey of Sellars’ views on the historical antecedents and meta-philosophical aspects of his thought. Luca Corti is the FCT Post-Doctoral Fellow at Mind, Language, Action Group at the University of Porto, Portugal and the International Center for Philosophy at the University of Bonn, Germany. He has published two books and several articles on Kant, Hegel and contemporary Hegelisms, as well as on Sellars and Sellarsian themes, including Senses and Sensations: on Hegel’s Later Picture of Perceptual Experience (2018), Conceptualism, Non-Conceptualism, and the Method of Hegel’s Psychology (2016), Ritratti hegeliani (2014), Crossing The Line: Sellars on Kant on Imagination (2012). Antonio M. Nunziante is Associate Professor at the University of Padua, Italy. His research is in the history of ideas and is mainly focused on issues concerning naturalism and normativity in the Early Modern Philosophy (Leibniz), in the Classical German philosophy (Kant, Hegel) and in the pre-analytic American philosophy (early American naturalism). His works include: Infinite vs. Singularity. Between Leibniz and Hegel (2015), The "Morbid Fear of the Subjective". Privateness and Objectivity in Mid-twentieth Century American Naturalism (2013), Lo spirito naturalizzato. La stagione pre-analitica del naturalismo americano (2012), Representing Subjects, Mind-dependent Objects. Kant, Leibniz and the Amphiboly (with A. Vanzo, 2009), Individuals, Minds and Bodies: Themes from Leibniz (ed., "Studia Leibnitiana", 2004). This series is dedicated to monographs and essay collections that examine, from diverse theoretical perspectives, any aspects of America’s rich web of philosophical traditions, from the 17th Century onwards. Frequently associated with pragmatism, particularly in the United States, American philosophy also encompasses many other schools of thought, and has had a significant impact on the development of contemporary epistemology, ethics, metaphysics, philosophy of language, philosophy of science, and political philosophy. By publishing outstanding treatments of its many diverse threads, this series aims to become the default resource for scholars and students interested in a full picture of American philosophy.